Over this past year, I finally quit my teaching job to become a full-time freelance translator and work from home in my tiny 1 bedroom apartment. My bedroom and office are actually the same space, but the size of my apartment isn’t the point of this article. What is, is how I’ve noticed how my body has changed, for the worse, over the last year and it obviously has to do with how much I sit. As a teacher, I was up and walking about my classroom for more than 9 hours at a time. Now, I’m sitting in my chair for those 9 hours (or more) at home. I love the freedom of being able to work when I want, for whom I want, and on whatever I want. I wouldn’t give that up for anything. If you’re in the same boat as me and wondering why your pants keep getting tighter than let’s answer this questions together: What about a stand up desk workstation? Although my professional life is doing quite well, my overall health and wellbeing have taken a nasty turn for the worse. I’ve put on about 20lbs, feel much older than my 30 years and the hour I work out a day just isn’t cutting it anymore. So, I went digging, and I found a lot of people were talking about stand up desks and stand up desk workstations. I exercise daily, eat reasonably well but I was still gaining weight, and I was frustrated about it because I’d never been ashamed of my midsection before. What I found was quite interesting actually. Obviously, exercise helps, there’s no doubt about that. Doing the recommended 150 minutes/week will definitely offset some of the adverse effects of sitting all day. Unfortunately, it’s just not enough. The same way eating a salad doesn’t undo smoking, or drinking water doesn’t undo that 6 pack you had while watching the game last night, exercising for an hour won’t offset sitting all day. It’s not a trade-off. Life doesn’t work like that, although many of us wish it did. Unfortunately, science is lacking a bit of ‘specificity’ here. The best the American Heart Association can give us is the mantra ‘Sit less, move more.’ It’s not all their fault though since you can’t prescribe walking to someone with a bad knee, or weight exercises to someone without a gym nearby. Giving one, umbrella answer to this issue is pretty much impossible. 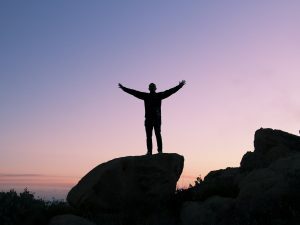 He’s basically saying that getting up every hour throughout the day significantly help you lead a healthier lifestyle. All you need is 5 minutes to move around and get the blood flowing. This will spike your metabolism for the next 55 minutes and delay the negative effects of sitting. Standing up every hour, when you’re in the groove seems like a lot though. Sometimes I want to finish a project and not look away. How can you stand up but also work at the same time? As I dug a bit more into this question, many articles started mentioning stand up desk workstations. The idea is quite simple actually. They’re small stand up computer workstations that you put right on top of the desk you already have. You can move them from a lower (sitting) position to a higher (standing) position. Most are spring or gas loaded, so they assist you with the lifting and lowering process. This means you can continue working while you’re on your feet, breaking up your day and avoiding those nasty side effects from sitting. 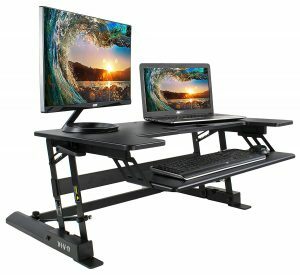 What About a Stand Up Desk Workstation? 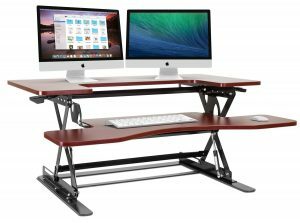 There are a few options for you to check out when you’re looking into stand up desk workstations so I’ll break them down for you here. This category comes with a few options. You have the one that you place right on your work surface. It usually comes with a flat top for your monitor and then a lower keyboard tray (as you can see in the photos). The raising mechanism is usually with gas with tubes on each side. Similar to the photo. You press a button to make it go up and down to where you want it. The next you clamp on your desk with a slide riser. It also comes with the upper and lower tray, but this one raises and lowers by using the tower that it’s connected to. I’ve written a few reviews on different workstations and here they are: Flexispot Standing Desk – Review after 100 hours of use and Varidesk Adjustable Height Stand up Desk. This, as the name implies, is one that doesn’t go up and down and you just put it on your desk. Unfortunately, you’ll have to move this one off if you ever want to sit and work (which you should!). If you’re looking for more options, I have 5 great ones in my article: The Perfect Height Adjustable Standing Desk. 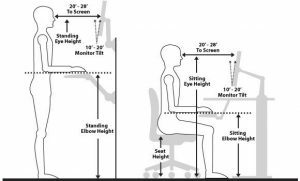 I’ve covered this a bit in my article: How to Use a Standing Desk, Properly but I’ll touch on it here. A stand-up computer workstation is not meant to be used for 8 hours straight standing at it! Standing for 8 hours is as bad, if not worse for you than sitting for 8 hours. As I mentioned earlier in this article, you need to break your day up into smaller, one-hour segments. 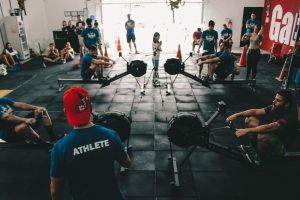 Research from Jack Callaghan, a professor in Waterloo’s Department of Kinesiology, has found that a ratio of 1:1 to 1:3 is found to be ideal. That means every hour, stand at least 20 minutes and at most, 30. You should also take a look at standing desk mat benefits to help you stay energized throughout the day. Standing or sitting for longer than those periods and you start seeing negative benefits. Also, make sure your standing desk is properly set up. Follow the picture below. It’s straightforward: Don’t look up, don’t look down and your elbows should be bent at 90 degrees when you type. 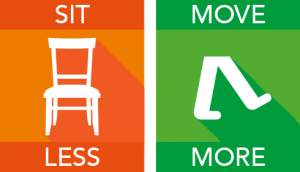 These are the same recommendations for when you’re seated, but you’re just on your feet. Being seated is the epidemic of our time. On average, Americans sit for 13 hours a day. Add that to the 8 hours sleeping, and we are sedentary for 21 of the 24 hours per day. No wonder obesity, diabetes, and heart disease are all on the rise. We don’t move. As freelancers, we have the freedom to make positive changes in our lives that many office workers don’t have. The point of being freelance is to work in the conditions that we want to work in. Sitting all day is slowly killing you. It’s time for a change. Based on the research, getting your a stand-up desk workstation and using it, is definitely a big step in the right direction to a healthier you. So I ask again, what about a stand up desk workstation? Our office is where we, as freelancers, go into out ‘work mode’. It needs to be set up right, or you’ll constantly be getting distracted. For a few handy tips to keep in mind, check out How to Organize a Home Office – Function and Comfort over Form. What about a stand up desk workstation? Have you tried one? I really enjoyed your article regarding Stand Up Desk Workstations. I never really given them that much thought actually, as I’ve always worked in controlled environments myself. What you said makes total sense though when you look at it from a healthy perspective. I remember doing social work and sitting for hours on in before I moved to california. I had put on so much weight! I was 250 lbs when my normal weight should have been 205-215. Luckily sense then i’ve worked it off, but I can’t help but to imagine if I integrated this logic into my everyday workday how much it could have benefited me 🙁 The more you know, I tell you. I may just look into this stand up desk for my at home business, or at least utilize the option to move every hour. Thanks for the knowlege! I appreciate you taking the time to leave a comment. It doesn’t really make much logical sense to think that 45 minutes to 1 hour of actualy physical activity would be enough to offset 20 hours or so of doing nothing, and yet most people do exactly that. I’m glad you were able to work off that weight. It can be really tough trying to get back into a routine after you’ve lost that habit. 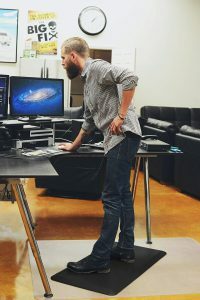 I wish you all the best and if you’re looking for a few good standing desk options you can check out my article: The Perfect Height Adjustable Standing Desk – Any budget, any sized office. It will give you a really good place to start. Good luck! Well, I have been working from home as well for the past one year and I never realized the real reason for not losing weight even though I did yoga and exercise. After reading this article I realize the reason. I have been ignoring this for a really long time and no wonder my body felt bloated all the time. The standup workstation sounds good or another thing we could possibly do is take a break every 45 minutes and have a 5-minute walk? I don’t know I think the stand-up workstation seems tiring. Thank you for leaving a comment. Taking a break every 45 minutes and going for a walk is a great solution as well. As long as you actually do it. I’ve found that when I’m working away and in ‘the zone’ I don’t want to stop and walk around. I feel like I lose my groove a bit. That’s why I’ve found that a stand up desk workstation takes about 3 seconds to move your chair and lift it to a standing position. No productivity lost and I’m able to move about while still working. Good luck with everything and if you ever have any questions please let me know! Happy Freelancing! The Stand Up Desk Workstation is not only used full for working from home freelancers but also for the office workers those who are sitting for 8 hours a day continuously. Even the companies could consider providing the Stand Up Desk Workstation facility to the staffs to prevent their health deterioration. Even I should consider buying one because I am getting backache due to continuous sitting. I enjoyed reading your article and it’s really useful. You’re absolutely right that these would be perfect for office workers as well. Many of the biggest companies, Google, Apple, do offer these as options for their workers. Not only do they improve output but also worker health, stamina and happiness. It’s really a win-win for both the company and employee. It could also be a win for a freelancer and their company if they get themselves one. 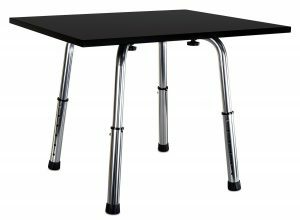 If you need a few options about different standing desks take a look at my article: The Perfect Height Adjustable Standing Desk – Any budget, any sized office. It’s a great place to start from. If you have any questions please let me know. Happy Freelancing! Sit Stand Smart Mat – Never Struggle with Your Desk Mat Again!